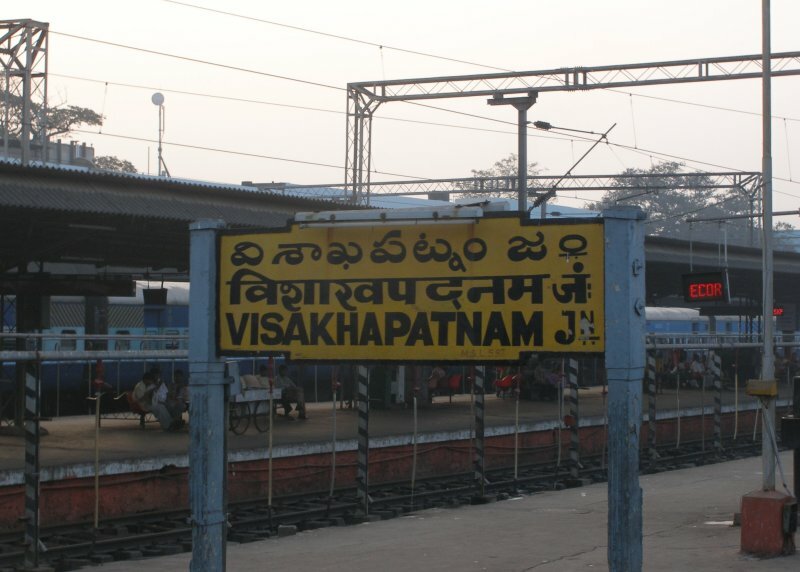 Visakhapatnam is well connected with most of the places in India & around the World by Road, Rail, Air and Sea. Traffic free by widening existing roads, implementation of Rapid Bus Transportation System (BRTS), separate lanes for Two/Three wheelers & Four wheelers, footpaths for pedestrians, footover bridges, cycling tracks to be constructed. Multi-level Parking complexes to be constructed in the main areas of the city. 2 BRTS road corridors from Pendurthi to RTC complex via Hanumanthavaka and via Kancharapalem to be completed. To prevent frequent traffic jams, roads to be widened at Jagadamba junction, Poornamarket, Dabagardens, Dwarakanagar, Akkayyapalem, Sankaramatham Road, Dondaparthy, Railway New Colony and Maddilapalem, Isakathota, Venkojipalem, Hanumanthawaka on NH-16. GVMC master plan proposal for inner Ring Road from Allipuram opp: railway reservation complex, South jail road, Rednam gardens, Ramnagar, Seven Hills hospital, Waltair main road, Siripuram, Sampath Vinayak temple road, RTC complex, Sangam sarat junction, Railway DRM office, Railway station, Railway reservation complex. 18.05.2017: The Visakhapatnam railway station is the cleanest, followed by Secunderabad, among the 75 busiest stations in the country. As per a survey report released by Railway Minister Suresh Prabhu here on Wednesday, the Jammu railway station occupied the third spot, while the New Delhi station was ranked 39. 18.12.2016: Indian Railway Catering and Tourism Corporation (IRCTC) has set up an Executive Lounge at Visakhapatnam station, a first of its kind in the Eastern Zone. Built over an area of 2710 square feet, the swanky lounge is situated on first floor of platform number one near the booking counter and it provides a string of facilities, both chargeable and complimentary. The fully air conditioned executive lounge is equipped with all the modern facilities such as recliner chair, Business Centre with Internet access, free Wi-Fi, Train Information Display, TV, bathroom with modern faucets and fittings and wash and change facility. IRCTC has empanelled Travel Food Services Pvt. Ltd, a leading service provider, for providing these facilities in the lounge. The rate for initial entry (for 2 hours) into the lounge is Rs.150. Subsequently for every hour an additional Rs. 50 will be charged. The facilities include two hours stay, free Wi-Fi, soft beverages (tea/coffee/refreshers), newspaper and magazine reading, train Information display, TV, toilets. The facility for recliner chair is chargeable. Thus a customer has to pay Rs 400 for entry in the lounge and use of recliner chair. Further, Rs 250 will be charged for every additional hour. The buffet breakfast is charged at Rs.150 with a variety to choose from. The lunch and dinner buffet is priced at Rs.250. There is also a convenience store in the lounge which offers foods, drinks, confectionery, travel accessories, local favorites, snacks and souvenirs. 30.03.2016 : EcoR announced the availability of Free Wi-Fi services in Vizag Smart City Railway station. The Wi-Fi services are available from PF-1 to PF-8 with the name RailWire Wi-Fi and the speed is 65 mbps. The Railway Authorities have installed 60 Wi-Fi points, out of this, 19 points are in the PF No. 1. Visakhapatnam City & Duvvada Railway stations are to be developed by installing escalators, lifts, provide basic facilities to the passengers. In Visakhapatnam, railways has the biggest Loco Shed and an excellent Coach Maintenance Depot and also abundant land bank near the Railway Station. 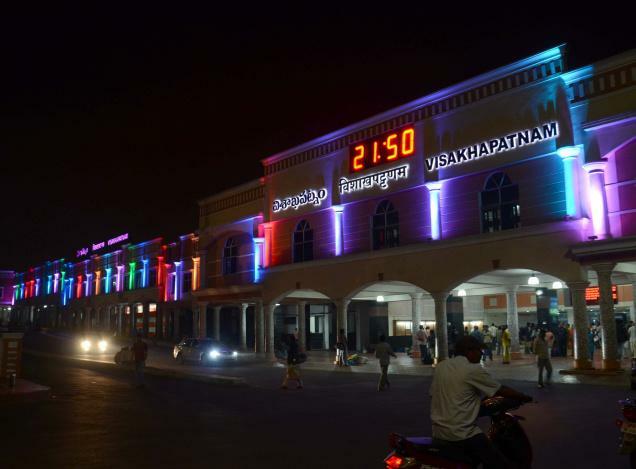 Visakhapatnam Railway station is under Waltair Division and East Coast Railway Zone, runs trains to all the major cities viz., Hyderabad, Chennai, Bangalore, Trivendrum, Mumbai, Kolkata and Delhi in the Country. 17.12.2017 : e-Visa services inaugurated at Vizag Airport. CM launches e-Visa services at Vizag airport Visakhapatnam. Chief Minister N. Chandrababu Naidu inaugurated the new e-Visa services at Visakhapatnam International Airport on 16.12.2017. Apart from Visakhapatnam, there are 24 such e-Visa centres in India. This will facilitate international passengers to have Visa at the airport but the required documents and other formalities should have been completed online before their arrival in India. 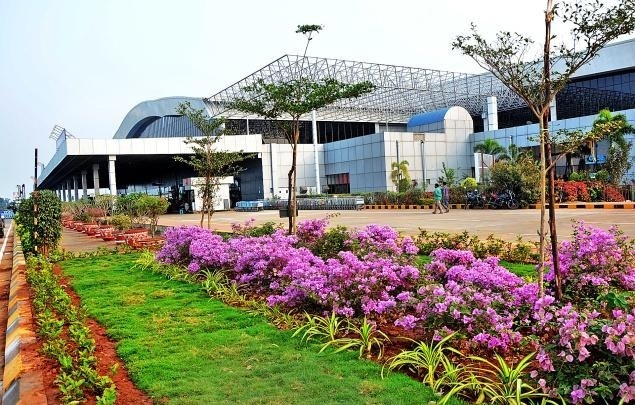 Visakhapatnam Airport is the first airport to have this facility in Andhra Pradesh. 03.11.2017 : International Air Cargo operations started on 02.11.2017 at the Visakhapatnam International Air Port. A small quantity of shipment sent through Srilankan Airlines on the first day of operations. The facility will be useful for the seafood, pharmaceutical units, exporters of mangoes, cashew as well as apparel and jewellery manufacturers in the districts of Visakhapatnam, Vizianagaram and Srikakulam. 18.10.2017 : Chief Minister, Mr. Chandrababu Naidu inaugurated the ceremonial lounge at Visakhapatnam International Airport on 17.10.2017. 08.07.2017 : SriLankan Airlines started operations of flight from Vizag to Colombo. 12.05.2017 : Vizag-Colombo flight to be operated four days in a week. SriLankan Airlines, which has already announced direct flights from Vizag to Colombo with effect from July 8, has come out with inaugural special return airfares of around ₹ 13,000. The SriLankan Airlines flight would operate four times a week on Tuesdays, Thursdays, Saturdays and Sundays. The flight will leave Colombo at 7.10 a.m. and reach Vizag at 9.10 a.m. and take off from Vizag at 10.10 a.m. and reach Colombo 12.15 p.m.
29.04.2017 : The four airports in Andhra Pradesh have registered a robust growth in air passenger traffic during 2016-17 fiscal with the Visakhapatnam International Airport leading by handling an all-time high of 23.58 lakh passengers as against 18.04 lakh in 2015-16. The city airport registered a growth rate of 30.7% in 2016-17. Visakhapatnam Interntional Airport is connected to 13 domestic destinations and three international destinations including Singapore, Kuala Lumpur and Dubai. 06.04.2017 : Vizagites often fly to Hyd, Bengaluru, Delhi & Chennai - Even as 2 million passengers travelled via Visakhapatnam Airport in the last calendar year, Hyderabad followed by Bengaluru, Delhi and Chennai are among the most favoured cities by air passengers from the port city in 2016. 23.02.2017 : Visakhapatnam Airport have witnessed and increase of around 42% growth rate in the last year. The airport has handled 2.1 million passengers including domestic and international during the 2016 calendar year. Domestic air traffic in 2016 was around 20 lakh as against 14 lakh in 2015, international air passengers at Vizag dropped from 1.1 lakh in 2015 to around 1 lakh in 2016. The dropped rate of international passenger traffic is due to the pull out of Malindo Air, which was operating flights between Vizag and Kuala Lumpur, in February 2016. Vizag Airport handled around 50 flights on an average each day in 2016 as compared to around 40 flights on an average in 2015. This clearly indicates that there is a visible growth in the standards of the city. 08.09.2016 : Vizagites want better global air connectivity - Sri Lankan Airlines, Air Arabia did a survey on air traffic. 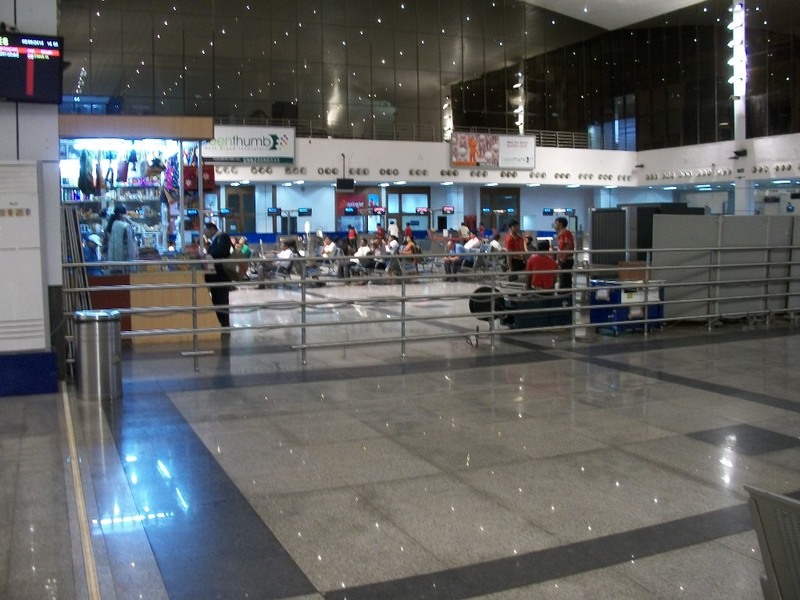 Vizag International Airport top among the four airports in terms of passenger traffic. In 2015-16, Vizag International Airport witnessed international footfall of 1.21 lakh as against 59,995 passengers in 2014-15. 24.08.2016 : * Passenger traffic crossed 18 lakhs during this year. * New Terminal building and Entrance for the domestic travellers. * Constructing 6 New Bays for Aeroplanes parking with a cost of Rs. 60 crores. * More National and International flight services soon. * Separate terminals for Domestic and International travellers. Expansion of Visakhapatnam International Airport is very much required because many international airlines are going to operate their flights from Visakhapatnam and also domestic traffic is increasing day by day. 10.02.2016 : Vizag Smart City's International Airport to get 'A' grade airport status soon, as the passenger traffic crossed 15 lakhs in the year 2015. Last year April to August passenger traffic is 4,64,548 and this year for the same period is 6,77,779, there is an increase of 2,13,231 passengers.In the month of September 2015, 2,13,231 passengers travelled from Vizag International Air Port. From Visakhapatnam International Airport various Domestic Air lines operating their services to Vijayawada, Tirupati, Hyderabad, Mumbai, Kolkata, Bangalore, Chennai, Delhi, Raipur, Bhubaneswar, Kochi, Port Blair, Srinagar and various International Airlines operating their flight to different destinations in the World. Air India to Dubai, Silk air to Singapore, Air Asia to Kaulalumphur and Srilankan Airlines to Colombo. Domestic air cargo complex operations started at Visakhapatnam International Airport. 05.08.2017 : The first rake to Nepal, comprising 90 containers, was flagged off by Visakhapatnam Port Trust Chairman M.T Krishna Babu at the Visakha Container Terminal Private Limited (VCTPL), here on Friday. Speaking on the occasion, he said that the Government of Nepal had notified Visakhapatnam as the second port of call after Kolkata-Haldia. "This is the first time a full-fledged rail rake is going to Nepal from here and we expect the volumes to grow in future, as the draft at the VCTPL is much deeper than at Kolkata-Haldia and bigger vessels can be handled here." 02.04.2017 : The Visakhapatnam Port Trust (VPT) has registered a growth of 7% by handling 61.02 million tonnes during 2016-17 fiscal as compared to 57.03 million tonnes in 2015-16. The VPT witnessed an incremental traffic of 4 million during 2016-17 fiscal, coming back on the growth trajectory after a lapse of five years despite severe competition from neighbouring ports and volatile economic conditions. 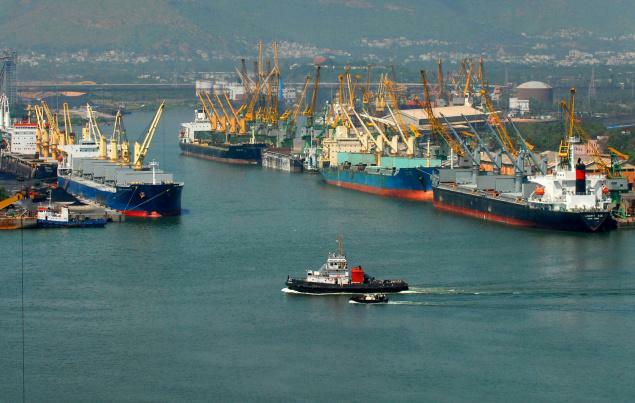 Visakhapatnam Port is one of the leading major ports in India. The port is located in the east coast of India. The port has three harbours viz., outer harbour, inner harbour and fishing harbour. The port has 24 berths. Passenger ship from Vizag port to Port Blair (Andaman Nicobar Ilands). Visakhapatnam Port Trust has mooted construction of an elevated freight corridor from VCTPL near Fishing Harbour to Convent Junction to decongest city roads. VPT Chairman M.T. Krishna Babu says funding for the project will be sought under Sagarmala project. A flyover up to a length of eight km is proposed to decongest traffic via Three Horse Junction, St. Aloysius School Junction and seven-metre high compound wall of the port. In a significant development, Visakhapatnam Port Trust (VPT) has sought funding for an elevated freight corridor (EFC) under the ambitious Sagarmala project of the Central government to decongest traffic on National Highway. The project, which is in conception stage, envisages laying corridor linking Port Connectivity Road, Gangavaram Port and join highway on Anandapuram-Anakapalle route via Sabbavaram to ensure speedy evacuation of cargo. The project will cost around Rs.800 crore.“We have submitted a report to the Centre. Depending on the response, the modalities will be worked out for implementation of the project mainly aimed at avoiding choking of highway in the city limits,” Visakhapatnam Port Chairman M.T. Krishna Babu . Visakhapatnam Port Trust, one of the 12 major ports in the government sector, is investing huge amount mostly in PPP mode to achieve a cargo handling capacity of 125 million tonne in next three years. Visakhapatnam Port Trust is planning to set up a Multilevel Logistics Park near Anakapalli in a 400 acres of land with a capital cost of Rs. 500 crores, which will be the first Logistics park in the East Coast of India. This park will be useful for storage/distribution of items imported from Singapore, Malaysia, Japan, South Korea, New Zealand and Australia to the various destinations in the Country. It also fulfil the market needs of 7 States within the range of 600 Kms from Visakhapatnam. 25 Kms long railway line also to be laid from the Vizag Port to the proposed logistics park. In this Logistics park, facilities like warehousing, cold storage, assembling, packing units facilities also to be provided. With this proposed International Standard Logistics Park, Visakhapatnam will become the International Business Center. Government of Andhra Pradesh has allotted 400 acres land to Visakhapatnam Port Trust for setting up Logistics Park near Anakapally. In a landmark achievement, Visakhapatnam Port Trust received a fully laden gearless Panamax vessel with a draft of 14 metres in the inner harbour on Monday (28.09.2015), signalling the completion of long-awaited capital dredging. This is a highly challenging task involving rock dredging because of which the project conceived 2009 got delayed. This is, perhaps, the first-of-its-kind in the world going by the need for large volume of rock dredging for which several foreign companies had expressed apprehensions over its success. The Visakhapatnam Port Trust recorded a cargo of 58.04 MT during the Financial Year 2014-15 retaining its fifth rank among other ports with Kandla occupying the top spot followed by Paradeep, JNPT and Mumbai. 06.04.2016 : Ministry of Environment and Forests has approved the expansion of container terminal. The estimated project cost is Rs. 633.11 crore and the work will be commenced soon. Visakha Container Terminal Pvt Ltd (VCTPL) will take up this project. Also, Vizag Port proposed to modernize the Oil Refinery berths OR1 and 2 with an estimated project cost of Rs. 200 crore in the next two to three years. 16.04.2016 : The Maritime India Summit, 2016 in Mumbai proved to be a big boost to the Visakhapatnam Port Trust as it has signed five MoUs with various organisations on Friday. The MoUs and the modernisation programme of the port would boost its capacity to 125 MT in the near future. The MoUs were signed by Deputy Chairman of VPT with representatives of the organisations in the presence of Union Minister for Shipping Nitin Gadkari, Secretary to Ministry of Shipping Rajive Kumar and Chairman of VPT M.T. Krishna Babu. The VPT has signed an MoU with Visakha Container Terminal Pvt Ltd. for establishment of second container terminal with an investment of Rs. 633 crore on PPP mode and entered into another MoU with HPCL on allotment of land for expansion of the latter’s refinery capacity. The third MoU was with ITD Cementation for reconstruction of EQ2 to EQ5 berths . The project is expected to be completed in the next 24 months. 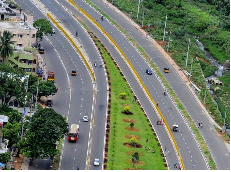 VPT and a JV between it and NHAI, the Visakhapatnam Port Road Company, agreed on an MoU for extension of the two-lane road connectivity to NH-16 into four lane . The fifth MoU was between VPT and Balmer & Lawrie for establishing Multimodal Logistic Park on 100 acres of VPT land. 25.05.2016 : Vizag Port Trust Chairman Mr. Krishna Babu said that Two Heavy Flyovers to be constructed in Vizag Smart City under Sagarmala Project. Central Govt has agreed in principle for this project and the Detailed Project Report (DPR) will be ready by next month end. 1. Convent Junction to inside the Port for free flow of heavy vehicle traffic into the Port, with an estimated cost of Rs. 100 crores. 2. Sheelanagar to Sabbavaram, 13 kms, with a cost of Rs. 500 crores, which is to be linked with the proposed Anandapuram to Anakapally 6 lane National Highway (NH-16) bypass road. 14.10.2016 : The port handled 30.67 million tonnes in the first half of current financial year compared to last year's 27.64 million tonnes. The marginal increase in throughput and completion of mechanisation of some of the berths has also given the hope that the port would achieve 61 million tonnes target set by the Ministry of Shipping for the current year 2016-17. The total cargo handled last year 2015-16 was 57.03 million tonnes. 21.11.2016 : 21.11.2016: Four VPT berths set for 'makeover'. As part of its modernisation move, the Visakhapatnam Port Trust (VPT) has started the process of decommissioning the four berths from EQ 2 to 5 and constructing two new berths in their place in the inner harbour of the major port. The contract for decommissioning of four old berths and construction of two new berths has been awarded to ITD Cementation, VPT officials said, adding that the work is expected to be completed in the next two years. VPT sources said that initially EQ 2 and EQ 3 are being decommissioned. Gangavaram Port is the deepest all weather port in India with round the clock operations. State of the art cargo handling equipment. Central Control Room controlling all the mechanized cargo. Most advanced RADAR system with AIS. A truly next generation Port. 14.07.2018 : Union Minister for Shipping Nitin Gadkari on Friday inaugurated the newly acquired cranes by Visakha Container Terminal Private Ltd (another BOT operator of Visakhapatnam Port) valued at Rs. 151 crore. VCTPL has procured recently two Post-Panamax Quay Cranes and four rubber tyre gantry cranes to meet the increased container traffic requirements of the region. The quay cranes are capable of handling 41 tonne weighing containers on a vessel of 18 across (approximately 10,000-12,000 TEUs capacity). 22.04.2016 : First vessel named after City of Destiny, Vizag Smart City - SSL Visakhapatnam. Haribabu flags off SSL Visakhapatnam after its maiden call at VPT. In line with the growing importance of the city, an Indian flag 24000 DWT container cargo vessel has been named after the city. SSL Visakhapatnam of Bombay-based Shreyas Shipping and Logistics Limited was flagged off after its maiden call at the Visakhapatnam Port by Visakhapatnam MP Khambampati Haribabu here on Thursday. The 1,613 TEU capacity vessel carrying over 1,000 containers set sail the from city to connect to Jebel Ali and Mundra, as part of the fixed day weekly coastal shipping service being provided by the liner. Visakhapatnam Container Terminal is the India's fastest emerging prominent destination for global trade 'Containerisation' and the vision is to evolve as a Regional hub on the East Coast of India. Visakhapatnam Port Trust believes that with the completion of extension of Visakha Container Terminal with an investment of Rs.633 crore, the demand for container cargo will witness a quantum jump in the next two to three years. 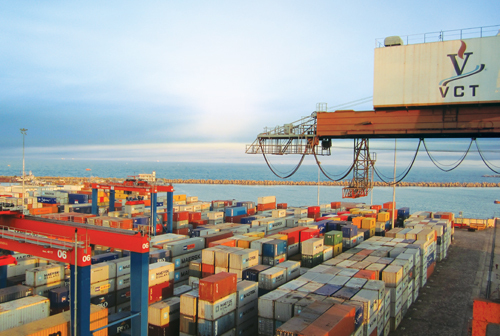 Container service from Vizag port to Yangon port in Myanmar from September 4, 2015. Simatech extend its service to Vizag. Simatech, a pioneer in feeder service in the Gulf, Indian Sub-Continent, Far East and East Arica has extended its service to Visakhapatnam. With the addition of Simatech service, the city now has the unique distinction of having all the prominent feeder operators deploying their weekly services connecting Colombo, Singapore and Jebel Ali. The service will utilize four 2000-TEU container ships, with three vessels deployed by Simatech and remaining one operated by Evergreen Line. The port rotation of the service is Vizag-Krishnapatnam-Chennai-Colombo-Cochin-Jebel Ali-Sohar-Cochin-Colombo-Vizag. The weekly service will be operated on every Tuesday at Visakha Container Terminal. Direct cargo container operations started from Visakha Container Terminal to Jebel Ali Port, Dubai & Sohar Port, Oman by Evergreen Line, fifth largest shipping company in the World. The team members stated that they were planning for commercial container operations from Visakhapatnam to Dubai. Earlier, they visited Visakha Container Terminal to study its operations. 26.02.2017 : Andhra Pradesh's first Multi Modal Logistics Park (MMLP) being promoted by Container Corporation of India Ltd (Concor) started its operations here in Vizag on Saturday i.e. 25.02.2017. The Union government had committed Rs 500 crore to set up an MMLP in the port city after bifurcation to enhance the container cargo handling capacity.Situated close to Vizag Airport along the national highway, the MMLP was inaugurated by East Coast Railway's Waltair divisional railway manager Chandralekha Mukherjee. The DRM said the railways would extend all support to the MMLP for hassle-free movement of containers on railway lines to various destinations across the country from here. "Two container cargo trains were operated on a trial basis in the past three weeks. Now, a train carrying empty containers has successfully left for Vedanta Alumina plant at Brundamal in Odisha from the MMLP here on Saturday. The railways is committed to promoting container traffic. I urge the industries to use the railways from the MMLP to reduce their logistics and inventory costs," Chandralekha Mukherjee said. "Also, travelling by rail is six times energy efficient and two to three times economical than road transport," Chandralekha Mukherjee said. MM Yelvender Yadav, general manager (engineering) of Concor and head of the MMLP Visakhapatnam, said Concor earlier used the Vizag Port and Visakha Container Terminal Pvt Ltd with their available warehouse space of nearly 20,000 square feet. Now, Concor has developed the MMLP on 105 acres of land for Rs 500 crore. "We have so far invested Rs 300 crore to develop the MMLP and we will invest the balance Rs 200 crore in the next phase. We have so far built a container freight station and a warehouse with 50,000 square feet space. We are planning to handle 50 to 60 rakes (trains) in a month to various parts of the country from here. It will be of great use to the small, medium and large scale industrial units in the city and its neighbouring districts," Yadav said. The administrative office of Concor is currently located near the Sea Horse Junction close to Vizag Port and it will be shifted to the MMLP soon, Yadav said. 14.07.2018 : Union Minister for Shipping Nitin Gadkari on Friday dedicated the Essar Vizag Terminal Ltd (EVTL), subsidiary of Essar Ports Ltd, built at a cost of Rs. 830 crore to the nation. "The Vizag iron ore handling complex built by EVTL is a facility that is truly a national asset. We are committed to realising the government’s vision of port-led development," said Essar director Prashant Ruia.